Andy: My apologies for not being able to spend too much time for interviews due to my busy schedule as president of the events. I hope to be able to spend more time with the press after the award ceremonies. Reporter: Do you have high hopes for the Hong Kong nominees? Andy: I support all the films. I support all the films. Reporter: What do you consider to be a good Asian film? Andy: If the audience understands the story line. However, everyone has his or her own expectations. Even if it’s a film that I like very much, there is only one vote from me. During the ceremony, Lau sat next to the Excellence in Asian Cinema award winner, Michelle Yeoh (楊紫瓊), but took the stage twice: once to formally open the awards show, and again to present the Best Film nominees with Sylvia Chang (張艾嘉). It was during that announcement that Lau revealed his strategy for his vote, which was to watch each film twice (once to get through all the dialogue in various languages, and a second time to study the films more closely – both times without distraction from family members). 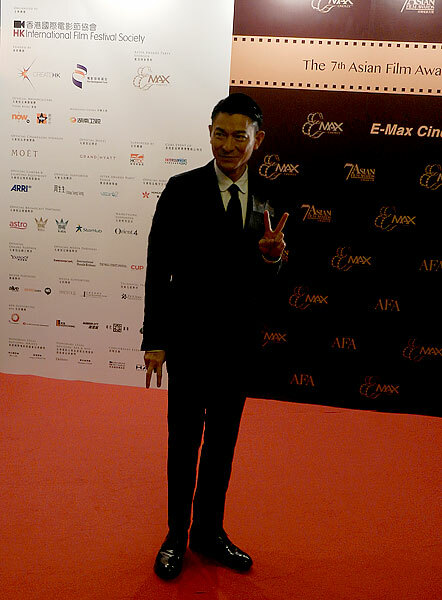 Lau lightly pumped his fist when “Mystery” (China, directed by Lou Ye) won. The film was a selection at the 2012 Cannes Film Festival.